This webpage is being kept for archival purposes only. It may be updated in the future, but it is not currently being maintained. 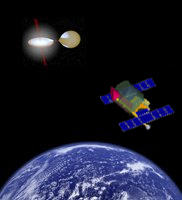 The Energetic X-ray Imaging Survey Telescope (EXIST) is a proposed hard X-ray imaging all-sky deep survey mission and was recommended by 2001 Report of the Decadal Survey. It was not ranked in the Astro2010 Decadal Survey. The mission concept will be reduced in mass and complexity to be compatible with a future Explorer MIDEX AO or (ideally) a "Probes Line" mission opportunity should NASA offer that opportunity for Astrophysics as is already the case for Planetary Science. understand the fundamental processes of space plasma systems with the AGN spectra and timing studies. EXIST is based on proven technology and would image and temporally resolve the entire sky every two 95-minute orbits, detecting extremely faint high energy X-ray sources in an energy range (5-600 keV) that is poorly explored but particularly important for the discovery and study of black holes. With its unparalleled sensitivity at hard X-ray energies, EXIST will allow the study of black holes on all size scales, with masses ranging from a few to more than one billion times the mass of the Sun. In addition to this hard X-ray capability, EXIST will include an infrared telescope that will follow up gamma-ray bursts, providing redshifts on timescales of minutes, and will provide multiwavelength spectra of the AGN found by the hard X-ray survey. Provide the most sensitive and wide-field measures of the transient universe with X-ray/OIR studies of Blazars, black hole transients and high energy variables (including stellar flares) with full-sky coverage every 3h, in synergy with GLAST and PanSTARRS, as well as LSST, JWST and other planned facilities. Secondary science objectives include surveys for: 511-keVpositron-electron annihilation lines in BHs, jets, and classical novae; soft gamma-ray repeater (SGR) superflares and magnetars out to 150 Mpc; 44Ti emission, to find obscured supernova remnants (SNRs) and determine the SN rate in the Galaxy. The High Energy Telescope (HET) is the primary instrument, consisting of 4.5 m2 of imaging CZT detectors in a wide-field coded aperture telescope. It covers the 5-600 keV band and images sources in a ~70° × 90° field of view with 2 arcminute resolution and ≤20 arcsec positions (90% confidence radius) for ≥5 sigma survey threshold detections. The Optical/IR Telescope (IRT) is a 1.1 m aperture telescope covering the 0.3 - 2.4 micron range with variable spectral resolution. The IRT pixel size is 0.15 arcsec and the field of view is 5 x 5 arcmin for both the optical and IR imaging and spectoscopic arrays. The HET Anti-COincidence System (HACOS) employing BGO scintillators rejects particle-background events (from cosmic rays) and also measures GRB spectra at energies from a few hundred keV to 20 MeV. The EXIST team is divided up into 3 science working groups and 5 technical working groups, and is guided by a steering committee.